Once inside, it's an altogether different world. Spacious tables on which lie complex-looking, unfamiliar machinery and rows of neatly arranged slender--bodied tubes of different sizes containing different-coloured liquids fill the room. The apron-clad, sharp looking young scientists sitting or standing across the tables are absorbed in their work. The only sound that breaks the reigning calmness of the surroundings is the crisp clicking sound coming off the computer buttons. Inside laboratories of The International Centre for Diarrhoeal Disease Research, Bangladesh (ICDDR,B), this is the usual picture all year round. 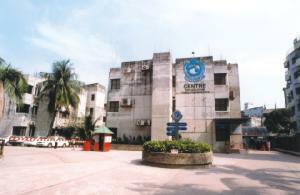 The state-of-the-art equipment which is comparable to the most sophisticated laboratories in advanced countries and the talented young scientists, from mainly home and also from abroad, led by world renowned names in their respective fields, have made the research units of the ICDDR,B a “Centre of Excellence”. Such effusive praise is the result of the Centre's scientific achievements in diarrhoeal diseases, nutrition, infectious diseases, population programmes and child survival strategies.